At beginning of each new year, I like to spend some time devoted to thinking “deep thoughts” and pondering important philosophical matters. 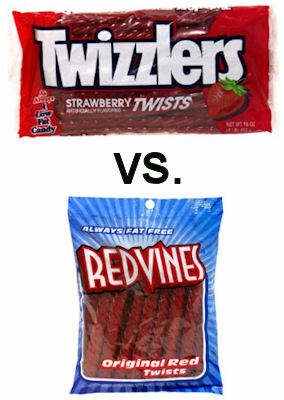 So my question to you is: Twizzlers or Red Vines? When I first developed my love of licorice, I was living on the East Coast. 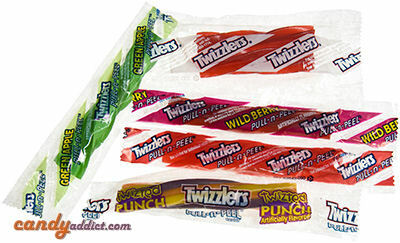 I grew up eating Twizzlers. No funky flavors like they have now, mind you, just yummy, plain old strawberry Twizzlers. I love licorice. So when I came across a value pack of mixed Twizzlers flavors it was like Christmas came early. The bag had a bunch of flavors I’d never heard of, along with some that were more familiar. Each flavor is wrapped in its own cellophane pouch so you can take your time making your way through the bag and you can open as many or as few as you like at any given time. Very convenient and a good way to make the bag last! Strawberry Twists: The most familiar in the bunch were the strawberry twists. These come two to a pack and are about 1/3 the size of a regular Twizzler. These have an artificial strawberry flavor and are a little softer and less waxy than regular Twizzlers. I don’t mind a bit of waxiness in my licorice so I didn’t find the wax factor off-putting in any of the flavors. The rest of the bag consisted of different Pull-n-Peel flavors. These bits of licorice pull apart into licorice ropes like I used to eat when I was a kid, except these have way more flavor. I have to confess that I love to play with my food. So playing with the Pull-n-Peel flavors was almost as much fun as eating them! It’s a good day for a Candy Addict when you stumble upon a new candy that rocks your world. I was in Walgreen’s the other day picking up a prescription for my newly-acquired bronchitis (long story) and what did I see but a display of new Fire Twizzlers. 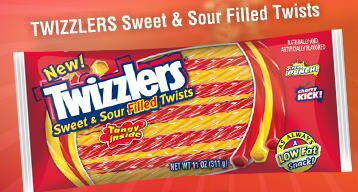 A cinnamon Twizzlers! When had these come out? I had heard nothing about them! With my love of all things cinnamon, especially Atomic Fireballs, I had to try them. 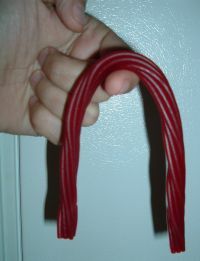 These Fire Twizzlers are of the “Pull – n – Peel” variety; nine shoestring-thin ropes stuck together to make one solid rope. As you can see from the picture, they are nice and fresh and wonderfully soft. If you like hot cinnamon candy like Fireballs, you’ll love these. Some of the bites have a nice spicy flavor to them that just tastes good. Some of them have a really spicy kick to them that makes me say “Damn, this is hot!” (but in a really good way). I love these things. They’re way better than Chewy Atomic Fireballs. These are the best non-chocolate candy I have eaten in ages and I am awarding them our coveted CandyAddict.com Awesomely Addictive Candy Award. I’m on my second bag in less than a week. 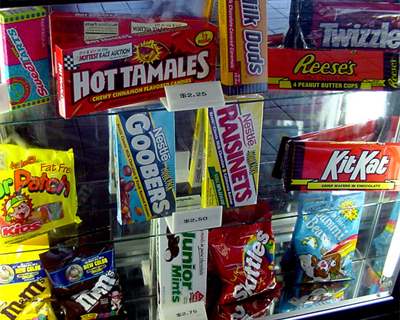 I talked with someone from Hershey’s and was told that “Fire Twizzlers are a customer exclusive – available only through Walgreens” – so if you want some of these, Walgreens is the only place to find them. The “Twizzler brand team” is supposed to be getting back with me with more information, but I wanted to go ahead and get this review out. I’ll update it if I get any more good info.